The waters had been relatively calm heading into the NBA's annual trade deadline on Thursday afternoon, but as is often the case, activity picked up around the league as the 3:00 PM deadline neared. 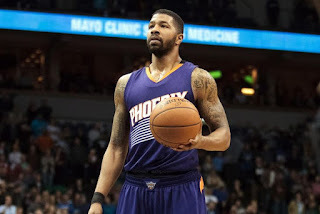 Looking for a boost in the frontcourt with their eyes on a run down the stretch towards the playoffs, the Wizards turned to Phoenix and traded for a dynamic 26-year-old forward in Markieff Morris just before the deadline. Originally the 13th overall pick out of Kansas by the Suns in the 2011 NBA Draft, Morris has proven to be a jack of many trades since entering the league. What will certainly be intriguing for the Wizards in the short term is Morris' recent form, as he has averaged 20.6 points, 7.6 rebounds and 4.6 assists in the five games since the calendar turned to February. For the season, Morris averaged 11.6 points and 5.2 rebounds per game in 37 games (24 starts) in Phoenix. Looking at the bigger picture and the relationship between the Wizards' desired style and roster, Morris fits well. At 6'10", he has both the ability and physical mentality to play in the paint alongside Marcin Gortat, but also possesses an excellent ability to run the floor and offensive range for his size that will serve him well in Washington's up-tempo offense. His knack for both stretching the floor and attacking the basket will only add versatility to the Wizards' frontcourt arsenal that already includes a sharp-shooter in Jared Dudley and a post-up specialist in Nenê. While Morris has dealt with injury issues this season that kept him from playing consistently in Phoenix in the first half, his play so far in February may indicate a return to the trajectory he was on prior to 2015-16. Since his rookie season, the versatile big man had improved his totals in points, rebounding and assists in each season heading into this year, averaging a career-high 15.3 points, 6.2 rebounds and 2.3 assists per game in 2014-15. Moreover, coming into a team that includes All-Star point guard John Wall should only help Morris, as Wall is one of the best in the league at finding teammates in good spots. There will certainly be a learning curve for Morris upon arriving in D.C., but one area that may help Morris is what will surround him within the team when he joins the Wizards. Both Gortat and Dudley were teammates of Morris' in Phoenix for two seasons from 2011 (his rookie season) through 2013. As they were then, Gortat and Dudley will be able to lend a hand as veteran leaders to help get Morris acclimated to the team as quickly as possible. Head coach Randy Wittman and the Wizards have built this season on the foundation of tough-mindedness, defense and pace on the offensive end. There's no question that Morris' skill set and mentality lend themselves perfectly to all three of those areas, and as the Wizards ramp up their push for the playoffs down the stretch, his red-hot play of late should help provide a big spark as a fixture in the Washington lineup.